In my opinion, the most advance stage that bazi study can go is to predict which month and even down to which day certain event can happen. And I will be more interested to know things that are more impactful to the Daymaster such as health, emotional trauma, losing job, accident and making good money. To me, these are more “life and death” matters as compared to “when I will meet my next boyfriend”. Nevertheless, I believe that to determine critical events in life, we cannot ignore the concept of bazi structure. For instance, in this chart, it belongs to the Eating God structure. There are certain “likes and dislikes” by the EG that we need to know by hard so that we can better take care of the EG structure which in turn has a direct impact on the prosperity of the DM. For your information, the EG structure would like to see friend or robwealth stars and wealth star to protect it. They are known as the Structural Useful God. It does not like to see Resource stars and Direct Officer star. Having them in the chart lowers the quality of the person’s destiny chart. Now, in a normal bazi reading we would read this as a weak bazi and one would usually pick Resource star and the RW star as the favourable elements. The question is, between this two, which one will you pick as the useful god? This is the part that you need to overlay the concepts of favourable elements with structural UG to “catch” the real UG that can influence ups and downs in your life. 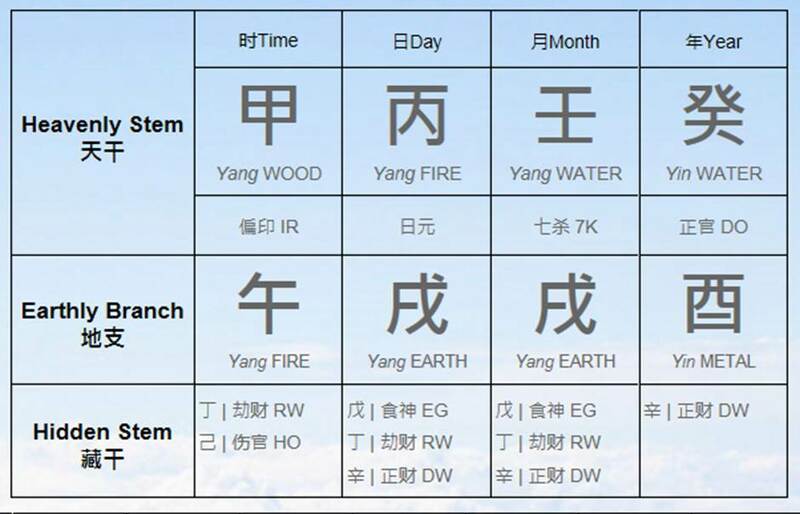 Based on the chart depicted here, most students tend to go for Jia wood as the useful god. This is not wrong because Jia wood strengthens the DM and arbitrate against the DO and 7K. However, it is not the best choice since EG structure does not favour resource by nature. In this instance, the Wu fire branch at hour pillar to me is the real UG because Wu is the protector of the entire EG structure. This means that going through fire luck will bring prosperity to the DM. Or having a child will also increase his or her luck especially if it is a girl. But this protector is at a vulnerable position. Why? Because it is not well defended or I should say it is not well positioned in the bazi. So, everytime this DM goes through Zi luck cycle, Zi year or Zi month, he or she will run into challenging issues. You can click on this link to read more about how UG is considered well positioned.